There is an economic measure that is rarely mentioned in the mainstream media that may help us to better understand the relatively modest performance of the economy since the end of the Great Recession. 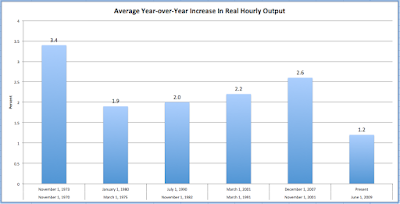 A drop in the number of hours worked and an increase in output that accompanies the end of a recession obviously puts upward pressure on the real output per hour. 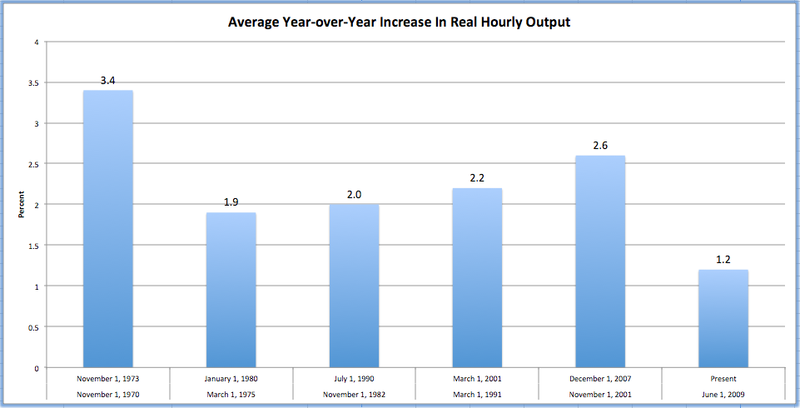 As you can see, the average year-over-year increase in real hourly output since the Great Recession is, by a wide margin, the lowest in the last six economic expansions. In fact, it is the lowest average going all the way back to 1947; by way of comparison, the average year-over-year increase in real hourly output during the expansion of the 1960s was 3.1 percent, hitting a peak of 7.0 percent in the first quarter of 1962. That certainly makes the most recent recovery look pretty mediocre, doesn't it? As we've seen, the post-Great Recession recovery has been spotty at best with the drop in the growth levels of real output clearly exhibiting one of the economic headwinds that have kept economic growth rates relatively low. With productivity growth declining, we should be keeping watch for both dropping growth in wages and profits in the future since both are closely related to increasing productivity. It is clear debt has become the main driver of both the American and global economy. This is not just about the auto loans we are seeing here in America, a giant debt bubble is forming that extends into many sectors of our economy. This is also happening in many places across the world.